Engineered for indoor environments where high heat and harsh chemicals are not present, the Custom MS-970 Coiled Plastic Markers are available in six sizes to fit pipe with overall outside diameters from ¼-in. to 5 7/8-in. (including insulation thickness). For pipe six in. 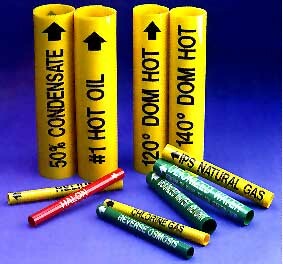 diameter and larger, three sizes uses plastic nylon straps to secure the marker around the pipe. Markers are available in standard colors including white, yellow, green, blue, red, and orange.